John Ringling was one of the early 20th century’s most prolific collectors of art. The Museum of Art is his legacy. In 1905 Ringling married Mable Burton, a woman who shared his love for and taste in art. Soon after their marriage they became fixtures in New York’s art auction houses, buying paintings, furniture and tapestries from the homes of the wealthy and socially prominent for their own growing collection. In 1924, the Ringlings met the prominent German art dealer Julius Böhler, a relationship that would prove crucial to Ringling and his growing interest in collecting art. The Ringlings had been traveling through Europe for years and had fallen in love with Baroque art. In 1925 he hired architect John H. Phillips to design and build a museum on his Sarasota property to house his ever-growing collection. What Phillips designed was a U-shaped pink palace with 21 galleries to house Ringling’s treasure trove of paintings and art objects, highlighted by a collection of masters that would eventually include Velazquez, El Greco, Van Dyck, Veronese, Tiepolo, Gainsborough and Rubens. Paired perfectly with the Renaissance-style of the Museum, the Museum of Art’s Courtyard embodied the ideals of the Renaissance garden. Its long loggias flank a central courtyard that features an impressive group of early twentieth-century bronze and stone casts of famous Classical, Renaissance, and Baroque sculptures, among them, at its heart, Michelangelo’s David from Palazzo Vecchio in Florence. Ringling hoped that by building the Museum he would make Sarasota a cultural and educational center. To achieve his vision he began buying comprehensive collections with prestigious provenances, beginning with the purchase of three rooms complete with furnishing, paintings and architectural finishes from the Astor Mansion and a villa in the Tuscan countryside. He also purchased four tapestry paintings, oil on canvas, by the Flemish master Peter Paul Rubens from the Duke of Westminster. Today these magnificent paintings welcome you as you enter the Museum’s gallery and are the foundation of the Museum’s extraordinary Baroque collection. Between 1925 and 1931, Ringling acquired more than 600 Old Master paintings from the Late Medieval thorough the 19th century. His purchase of Rubens’ Pausias and Glycera was considered so significant that Art Digest reported on it. 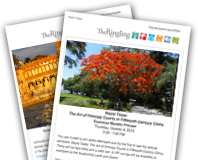 In 1928, Ringling made another significant acquisition that was to form the core of his classical antiquities collection, 2800 objects of Greek, Roman, and Cypriot antiquities from the Metropolitan Museum of Art in New York. Excitement about his collection was growing in art circles; the New York Times did a full-page article about the purchase, praising not only the collection but the Museum and its surroundings as well. That same year he bought the Parisian Gavet Collection, 300 hundred pieces of Late Medieval and Early Renaissance decorative art, sculpture and religious liturgical objects from the Vanderbilt’s Marble House in Newport, Rhode Island. In his will Ringling bequeathed his museum to the people of Florida, a gift he hoped would achieve his vision of creating in Sarasota a cultural and educational center. Hurt by the Depression, Ringling had fallen into debt and creditors and legal wrangling would delay the settling of his estate for a decade. Funds were poorly managed and the endowment Ringling left languished and barely grew. The Museum was only occasionally opened between 1936 and 1946 and not properly maintained. Gradually, the care that the buildings required were either put off or handled piecemeal. But while the Museum struggled with a lack of finances, a series of Directors continued to foster its artistic growth, most notably A. Everett (Chick) Austin, Jr. the charismatic former Director of The Wadsworh Atheneum in Hartford, Connecticut who became the Museum’s first Director and Curator in 1946 and served until his death in 1957. Other Directors followed and made their contributions: Kenneth Donahue, who served from 1958 until 1964 established the Member’s Council and started the quarterly newsletter; Curtis Cooley, the Director from 1965 to 1972 oversaw the completion of the West Wing and established the Museum Foundation; Richard S. Carroll created the Docent Program and had the Museum added to the National Register of Historic Places during his tenure from 1973 to 1984; Laurence Ruggiero, who served as Director from 1985 until 1992 established the Museum’s archives, during David Ebitz’s Directorship from 1992 until 2000 governance of the Museum was passed to Florida State University (FSU). The state promised to fund immediate repairs and in 2002 provided through FSU another $43 million to fund restoration of the Ringling – provided the museum board could raise another $50 million within five years. Thanks community efforts and truly generous public support, they exceeded beyond expectations and more than $56 million was raised by 2007. John Wetenhall, the Museum’s Director from 2001 until 2009 shepherded its extraordinary rebirth and oversaw the building of the Searing Wing, which provides more than 20,000 square feet of new exhibition space. Interim director Marshall Rousseau, a longtime Ringling supporter, oversaw the Museum after Wetenhall’s departure and in 2011 was instrumental in bringing Steven High to The Ringling. High is committed to expanding the range of Museum offerings by introducing audiences to those emerging talents in the international arts community. Under his leadership, a 10-year project, Joseph’s Coat, a Skyspace by modern master James Turrell, was completed, thrilling audiences by inviting them to contemplate light and perception as they gaze at the sky through a 24’ aperture, in the ceiling. High has also overseen the mounting of Paolo Veronese, the first major exhibition of the renaissance artist in over 20 years and the first artist that John Ringling acquired. In December of 2013 ground was broken on a new building that will house the Museum’s new Center for Asian Art. Opened in 2016, the Center provides educational opportunities for students, scholars and the public to better understand and appreciate Asian history and society through exhibitions, programs, and publications.